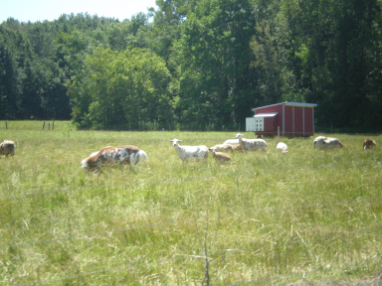 Welcome to our site: Hample Haven Farm is family operated. We use a managed grazing system which is better for the land. Grass-fed is better for your health! Our kids made an imovie trailer about our farm. If you would like to take a virtual tour of our farm, please click on this link: Virtual Hample Haven Tour. Please click the back button to return to our website after taking the tour. We sell grass-fed lamb and free-range eggs. Prepare it at your home using your favorite recipe - or we'd be glad to share one of ours. It's delicious and high in Omega-3's. If you would like to see more pictures of our farm, click here. 1. From Appleton, go north on County A about 8-9 miles. 2. Turn left (west) on County S, .7- 1 mile. 3. Turn right (north) on Hample Road, about .5 miles.